AuthorMitaliPerkins: Two Boys For Every Girl? Two Boys For Every Girl? What's it going to take to raise the value of a girl baby in India? A severe shortage of potential wives in about fifteen or twenty years? I hope the widespread practice of female feticide stops before then. 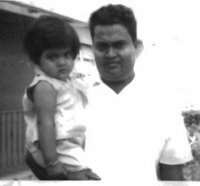 Third daughters like me (that's me with Dad in the photo) in sonless families probably rarely make it to birth these days. I know I blogged about this recently, but today the Christian Science Monitor reported that the decision to end the life of a girl baby is far more commonly (and surprisingly) made by educated women in India.